FREE POSTAGE offer from eka! FREE POSTAGE OFFER – to anywhere in the WORLD! just write EKA CHRISTMAS OFFER in the comments box when you order and we’ll refund your postage fee, offer open till Dec 24th. Have you bought your Christmas presents yet? 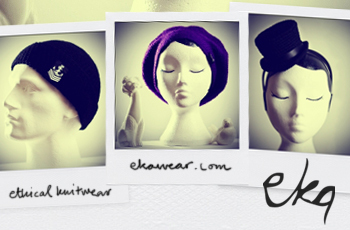 I just wanted to let you know that the eka online store is all stocked with this years collection of cozy knitwear. Here’s some gift ideas for ‘him’ and ‘her’. Ethical Accessories Brand eka give have an abundance of lovely, hand crafted knitwear for your Christmas list. Every item in the eka collection is hand made in the eco village of Auroville in India where profits go towards developing the town and surrounding landscape in environmentally friendly ways. Each employee working in Auroville is given a living wage along with health insurance and a pension. The Hayworth Beret with matching Mittens is a set of wooly luxuries any woman would be pleased to receive. For the computer nerds, there are sweet matching iPod and Laptop Cases, all hand made to a very high standard. There is a lovely cotton hat and mitten set which are not only grown organically, but also dyed using natural plant extracts. Trendy girls out there won’t be disappointed to see a lovely Hayworth Beret in under the tree, these hats are spot on trend with their floppy beret shape and are available in an array of colours from. What about a hand made Laptop Case and iPod Case to match? This winter boys won’t be seen dead without their ‘watchcap’, the eka anchor beanie is a firm favourite with the trend setting gents. How about giving him the most ethical hat out there? the eka organic range is both grown organically and dyed using plant extracts. What about a wooly deerstalker hat that has ears that can be folded down to keep the chill at bay?